Jumpsport 12' Stage Bounce w/mode 380 enclosure. The frame is heavy-duty, 1.8" diameter, Cold Rolled Steel (CRS) that is powder coated with a rich jet black finish to help protect against the weather. The frame has a 1.5mm wall thickness. 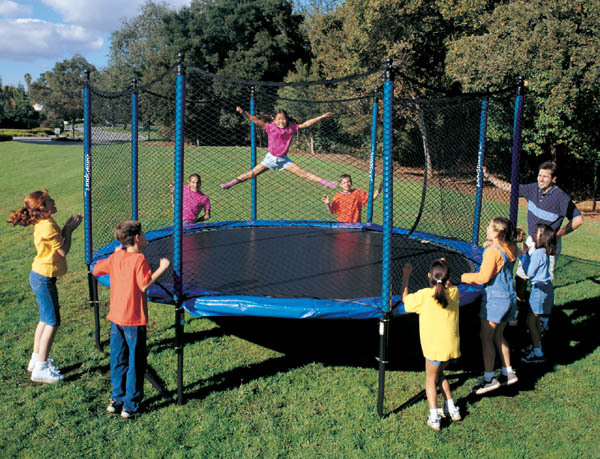 The trampoline jumping mat is 35 inches tall, for better ground clearance than most other trampolines. This allows us to use our exclusive 8.5" Extra-Stretch� springs for a deeper, more shock-absorbent landing and a greater return bounce.Our Extra-Stretch� High-Performance Springs are 8.5-inch long, zinc-plated steel. The 12' trampoline has 80 High-Performance Springs. Our springs provide excellent bounce with less injury potential than the stiffer, harder landing you get on someone else's trampoline using shorter, lower quality springs. Our mat has 10 rows of stitching and a UV shield (compared to just 4 rows of stitching and no UV shield on most other brands). The mat offers approximately 113 square feet of play space. We use high strength looped straps and steel V-rings for connecting the springs. All of our JumpSport� trampolines include our patent pending all steel "DD" Sure-Lok� system to prevent the frame from twisting and deforming. Other manufacturers build their frames with slip-fit (male/female) pieces that rotate and twist open over time causing the frame to become loose and wobbly, or even break. The frame pad is blue in color, over 13.75 inches wide, and 1 inch thick at the frame tapering to half an inch. Expanded polyethylene (EPE), closed-cell foam padding is used across the entire pad surface, not just at the edge. The foam is covered by a High-tenacity Polyvinyl Chloride (PVC) outer shell that is UV- and water-resistant. Other manufacturers use a cheap tarp material to cover the foam, which falls apart very quickly.Maximum single-user weight rating up to 235 lbs.